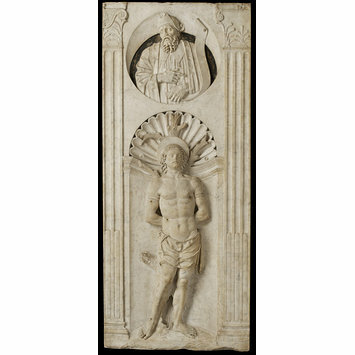 This relief would once have formed a section of a multi-part altarpiece, and would most likely have appeared on the right hand side, and furthest away, from the central panel. The companion piece (7389-1861) would have been between this relief and the central panel, because St Peter is always depicted on the right hand of Christ. Both were bought in Naples in 1860, having been placed face-down within the Jesuit's church and subsequently removed by a stone mason. The sculptor is unknown, however it is likely he would have been either from Rome or Naples. Marble, carved in high relief. 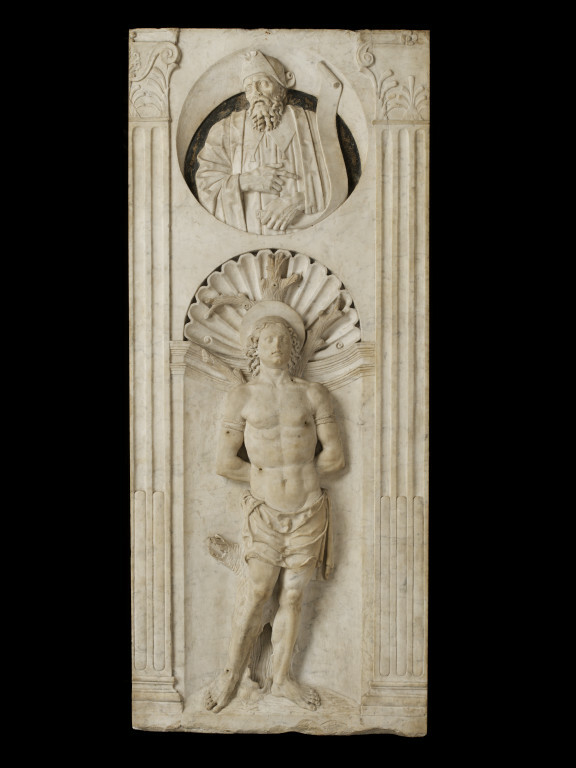 Full length figure of St Sebastian in a niche, wearing a loincloth and bound to a tree. Above is a circular medallion, enclosing a half figure of a prophet looking up, holding a scroll with one hand and pointing with his right hand. On the right and left are two incomplete pilasters. There are drill holes, for arrows, on St Sebastian's right arm and side, on his left shoulder and breast, on his right foot and thigh, and below his left knee. This and the accompanying piece (7389-1861) were purchased from a marble-mason in Naples in 1860. They had been found a few years previously, placed with their carved surfaces downwards, forming some of the pavement of the Jesuit's church in Naples. Historical significance: St Sebastian, the patron saint of archers and of soldiers, is most often depicted tied to a tree and pierced by arrows although in early representations he is an old man holding a crown. He was, apparently, a soldier in the Roman army and once it was discovered he was a Christian it was ordered that he be killed by being shot with arrows. Sebastian miraculously survived, and was subsequently beaten to death with clubs. This depiction of St Sebastian allowed for artists to portray young male figures and therefore their own abilities in anatomical representations. The saints represented at the top of the Gateway of the Castelnuovo in Naples are shown within very similar niches, with the semi-circular shell-like carving behind each head, and this seems to be a frequently used motif at this time. The prophets in the circular medallions above are a common motif in Naples and can be seen in the Placido di Sangro monument in San Domenico in Naples (1480). Robinson and McLagan & Longhurst ascribed the works to a Florentine artist working in Naples, however Pope-Hennessy instead ascribes the work to a native Neapolitan influenced by Mino del Reame and Paolo Romano, or alternatively the work of a Roman sculptor working in Naples. This relief is believed to have formed part of a pentaptych, and would have once have adjoined the (proper) left side of 7389-1861, with the (proper) left side adjoining the central panel. The pilaster on the (proper) left is different from the other three pilasters, which suggests it could have once adjoined the central panel. St Peter is usually depicted in the prime position at the right hand of Christ, however because of the missing edges to both these pieces it is difficult to be definite about their original form. The Jesuits had two churches in Naples before their expulsion in 1767: Gesu Vecchio, founded in 1557 on the site of a place belonging to the Conti di Maddaloni and of the old church of Santi Giovanni e Paolo; and Gesu Nuovo, founded in 1584 on the site of a palace constructed in 1470 by Novello da San Lucano for Roberto Sanseverino, Prince of Salerno. After the Jesuits expulsion the Gesu Vecchio passed from their control permanently. However, after the return of order to the city, the Gesu Nuovo remained the Jesuits headquarters until they were expelled again in 1860. It is therefore likely that, as these two pieces were bought in 1860, that they originated from the Gesu Nuovo.